Manick Sorcar's Animation at NANDAN Theater, A Smashing Hit! Sorcar's millennium program held at the prestigious Nandan Theater of Calcutta (January 1 through 7, 2000) enjoyed a thumping success. 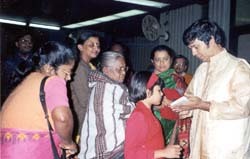 His two-hour program consisting of four of his award-winning animation films ("Deepa & Rupa' A Fairy Tale From India", "The Sage & The Mouse", "Sniff ", and "The Woodcutter's Daughter") and his latest animagic "Calcutta Forever - A Laser Fantasy" proved to be the highlight of the World Bengali Conference. The unique eight-minute laser animation which captured the 310 year old cultural history of the city mesmerized the viewers, and was recorded as the FIRST LASER ANIMATION based on a theme in the history of India. The show, which ran twice daily, was extended for five more days to meet the great demand. City's leading newspapers such as The Statesman, Times of India, The Asian Age, The Business Times, The Telegraph, Cine Advance, Ananda Bazar Patrika, Bartaman, Aajkaal, Protidin, Ganashakti, Sanmarg etc. gave rave reviews and featured Sorcar with special articles. 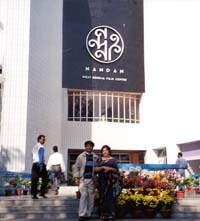 So popular was the show that in addition to the extension, it drew national news media such as ZEE TV, Doordarshan, and Star TV and magazine such as India Today and Illustrator to cover the news. It was attended by several dignitaries of the ministry cabinet, film stars, and also by the Chief Minster of the State of Meghalay and his wife who were visiting the City. "Another Manick, another magic for City of Joy......Sorcar's Laser Show - Calcutta Forever- is the first animation based on a theme to be screened at Nandan, which bags the honour of being the first Indian theatre to do so"
"Fairy tales have never been told with such charm and simplicity. Manick Sorcar's animation films delighted and moved film buffs in the city. Inspired home productions, the viewer was transported to the serenity of the illustrated page of long ago, when poems like Gandho Bichar and the tale of the two sisters and the mouse and the sage made Panchatantra and Aabol Taabol such islands of treasure. Long ago, when the turn of the page opened quiet village scenes in the mind's eye and the sailing moon made one sick with longing, scanning its whiteness for a glimpse of the 'chakra kata buri' (the old woman at the spinning wheel). When the best story was always heard and smelt and seen between the covers of a book. Manick Sorcar's animation films were full of the same astonishment and freshness of those years. The characterizations were at their best. And the real characters arose wondrously out of the exquisite illustration. And what kept it all so beautifully simple was Sorcar's consummate skill with animation. Sorcar who has also distinguished himself as a professor of electrical engineering confesses to 'loving light'. And his passion was manifest in the films." "Sorcar scion adds magic to city with laser fantasy. His father was an internationally acclaimed magician....If "Indrajaal" is the trademark for P.C. Sorcar, Jr., it's "Alojaal" for Manick Sorcar." "Manick Sorcar's magic of light at the World Bengali Conference"
"The central attraction of the day (January 1, 2000) at Nandan Theatre was the animation program of Manick Sorcar, which was attended by an avalanche of young viewers"
"Calcutta on Laser...it starts from 1690. Job Charnock came, saw, and won - followed by a series of many happennings....those who were disappointed with Lunetta's laser presentation at the World Cup celebration , will be totally satisfied at Manick's show..."
"Manick Sorcar has painted Calcutta with the brushes of light"
"Magic Moments: Manick Sorcar casts a spell on Calcutta! This Sorcar works his own magic. When Calcuttans heard that legendary magician P.C. Sorcar's son Manick was putting up a show - his first in the city - last week, many expected the typical tricks. What they got instead was a laser display packing 310 years of the city's history into eight minutes and some short, award-winning animation films by the family's very own computer wizard." "Manick Sorcar's laser magic stuns the city of Calcutta..."
"...The sheer virtuosity of the finished product (laser animation) is so impressive, that when watching the swift whirling of of Sorcar's laser animation, the viewer forgets the painstaking months of computer programming, research, sketching, and technical organization that are behind Sorcar's magic"
"Manick Is An Extraordinary Talent....Today when we see American or British cartoons on TV they only entertain us for the period we watch them; we forget what we saw as soon as they are over. Each of Manick's animation leaves an impression - it keeps us thinking even long after it is over...."
"...the Denver-based eldest son of the legendary magician P.C. Sorcar has kept the torch burning, albeit in a different light. Through his award-winning animation magic, he has achieved a marriage of the family art and science..."
-Sudeshna Banerjee in 'Folksy and Futuristic' - profile on Manick Sorcar. 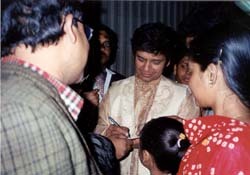 "...Out of all the programmes that were held for the entire Biswa Banga Sammelan (World Bengali Conference), only Manick Sorcar's animation show at Nandan drew tremendous interest of the public, and they emerged with full satisfaction after seeing it". "Sorcar's 'animagic' conjures up new tricks. With his grooming in the enigmatic world of magic, sorcery and illusive stage performances in the country's best known magician family, Manick Sorcar's peers expected him only to further the 'abracadabra' legend. But the eldest son of the legendary P C Sorcar had a trick of his own conjured up at the back of his mind ever since he took to painting his father's mammoth sets -- a trick he calls 'animagic'. With a heady cocktail of his father's unforgettable sleight and cutting edge laser animation, Sorcar has set a trend for this parallel art form, which took the western world by a storm and was introduced in India last winter." "Reaching Out To Children: Manick Sorcar, eldest son of the famous PC Sorcar, creates magic with different raw materials - laser technology and computer wizardry. And his animation films have won some very prestigious awards....A 'Manick' in the family of 'PC' Sorcars clearly indicates that the great father's eldest son didn't want to capitalise on the family name"